One of the most appealing things about PC gaming is the ability to hand-pick each part and fine-tune every aspect of your setup exactly to your liking. However, there’s no denying that sometimes it’s just easier to get certain things pre-packaged. 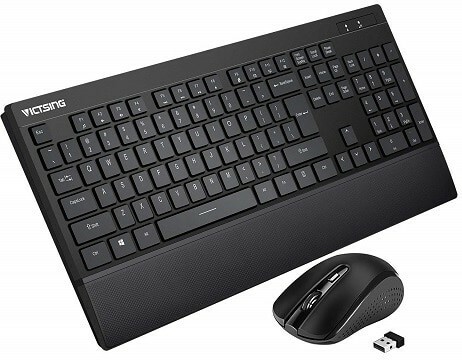 In this article, we’ll be listing some of the best wireless keyboard and mouse combos, which are just what the name implies: a keyboard and a mouse that come together in a single convenient package, making them ideal solutions for use at work or at home. The first on this list is a highly affordable wireless keyboard and mouse combo from Mpow, a company that deals primarily in wireless audio equipment. And while other types of peripherals are hardly their forte, both the mouse and keyboard being sold in this package are a decent deal. Both sport a sleek design that’s light on details. The keyboard implements low-profile chiclet keys and is quite good for typing, although chiclet keys are obviously not the best fit for gaming due to their short travel distance and limited tactile feedback. The mouse, while highly basic, actually does have adjustable DPI, including 800, 1200, and 1600 DPI modes. On the downside, while both the keyboard and mouse look nice, it is quite obvious from how light they both are that the manufacturer had skimped on the build quality. As such, both the mouse and the keyboard feel light and cheap, and even the markings on the keys are quick to wear off after a few months of use. So, what does this combo have going for it? 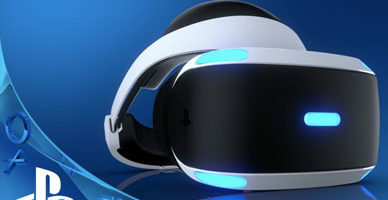 Well, mainly, it’s rather cheap and it looks good, making it suitable for casual or office use, although the chiclet keys and the lackluster build quality make it a very poor choice when gaming is concerned. Next up, we have a little more expensive and slightly better-built keyboard and mouse combo from Jelly Comb. And unlike Mpow, affordable keyboards and mice are their primary niche, so how does this particular combo fare? Well, for one, a single glance at the keyboard and one will be able to tell that it was not designed for gaming – it is highly compact and reminiscent of Apple keyboards of this kind. While highly portable and incorporating decent scissor switches, not many gamers will find this keyboard comfortable for long gaming sessions. The mouse doesn’t fare much better in this respect either. While it comes with adjustable DPI like the Mpow mouse (800/1200/1600), the sensor does feel more responsive and more accurate. However, the flat, Apple-inspired design of the mouse does not make it quite ergonomic for gaming. Finally, the biggest issues with this combo are the aforementioned switches. They are quite loud, but the noise isn’t nearly as much of a problem as the durability issues, since the switches tend to give out after a certain period of time. Luckily, Jelly Comb seems to offer responsive customer service and is quick to replace malfunctioning keyboards, although some might not care for all the hassle. In the end, if portability and affordability are your top concern, we can wholeheartedly recommend this combo. After the highly compact Jelly Comb keyboard, we have a much heftier one coming from VicTsing that also happens to be better suited for gaming. The mouse, too, is more ergonomic and much more comfortable to use, albeit it still only includes the most basic features. The keyboard utilizes low-profile chiclet keys which, as we’ve mentioned before, are hardly the best choice for gaming, although the built-in palm rest does help in the ergonomics department. So, while it doesn’t have the most tactile keys out there, the keyboard can still be comfortably used for gaming. 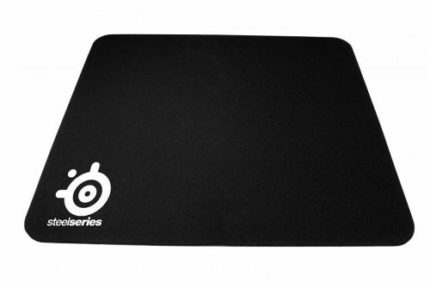 As for the mouse, we have the same three-step adjustable DPI (800/1200/1600) and a mediocre optical sensor, although the comfortable ambidextrous design is definitely welcome. Despite this, some might still find it to be a tad too small. All in all, is it a good gaming keyboard and mouse combo? Not quite, but it definitely comes close if you’re looking for a cheap wireless keyboard and mouse combo that can be used for gaming. You’d be getting a full-sized keyboard with a built-in palm rest, as well as a decent ambidextrous mouse, and all of that at an approachable price. 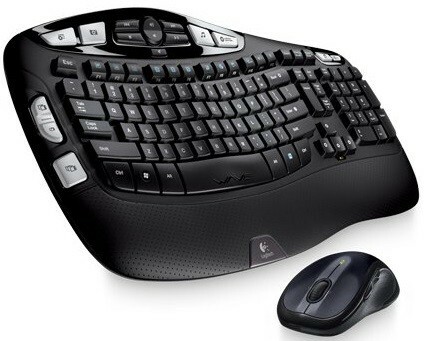 The next entry on this list is an immensely popular (if rather dated) wireless keyboard and mouse combo that includes the Logitech MK550 wireless keyboard and the MK150 wireless laser mouse. The keyboard itself boasts a bulky frame and an uncommon design that seems to prioritize ergonomics. Apart from the padded palm rest, there’s the namesake “wave” design that we don’t see much of anymore. That, the prominent multimedia keys, as well as the general key design, are all trademarks of the Windows 7 era peripherals. The years were not particularly kind to the MK150 mouse, as it is nothing special by modern standards. It is a laser mouse, though, and it is fairly accurate, despite the fact that the sensitivity lags behind newer optical mice due to the 1000 DPI sensor. Furthermore, it’s ambidextrous with two extra buttons on the side, although it doesn’t support adjustable DPI. 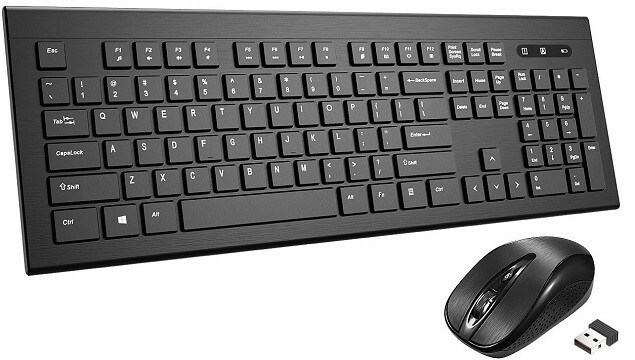 All things considered, this is a decent wireless keyboard and mouse combo for gaming. However, it is still quite pricey, despite the price cuts, and it costs as much as a decent mechanical keyboard, so not the best value in our book. But if you like the design for its ergonomics and the “retro” feel, then you may want to give the MK550 and the MK150 a go. And for the final entry on this list, we have yet another Logitech MK keyboard, only this time it’s the subtler and more modern-looking MK360. The keyboard adopts a cleaner and more minimal design compared to the MK50, all the while sporting the same low-profile chiclet keys which are prevalent among wireless keyboards. There are no standout features other than the couple of extra function keys and the overall portability. The mouse is a bit of a weak point, as it is a highly basic 1000 DPI optical mouse with a compact frame and no extra functionality to speak of. And while very easy to transport due to its diminutive size, that same compactness will inevitably make it difficult to use for gaming. In the end, if you’re looking for a good wireless keyboard first and the mouse is more of an afterthought, then the MK360 would be a good buy. Just keep in mind that the mouse, in particular, is a very poor fit for gaming due to its size, low sensitivity, and lack of any additional functionality. So, all in all, which of these wireless keyboard and mouse combos comes out on top? If he had to make our pick, it would be the VicTsing wireless keyboard and mouse combo. Why this one? Well, simply because we feel that it presents the best value for your money. Now, when you’re going for a combo, chances are you’re not looking for a gaming mouse and keyboard of the very highest quality but simply a set that will get the job done at the lowest possible price. In that regard, the VicTsing combo would be your best bet – the keyboard is ergonomic, great for typing, and the keys are fairly responsive, all the while the mouse is accurate enough and fairly comfortable to use in its own right. In the case that you’re actually looking for a higher-quality keyboard and mouse for gaming purposes, we’d advise getting a mouse and keyboard separately. That way, not only will you get better value for your money, but you might actually end up spending less overall. Check out our keyboard buying guide and our gaming mouse buying guide, and you’re bound to find the best fit for your needs! Furthermore, if you’re interested in a more affordable mechanical gaming keyboard, then it might be a good idea to check out this buying guide as well.